There are a number of uses for these shrubs in herbal medicine, but the culinary delights of these wonderful berries should not be overlooked. 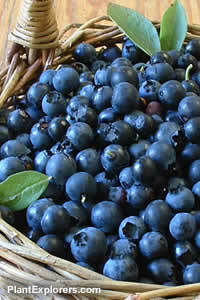 The complex flavours of wild blueberries are quite remarkable when compared to berries produced from modern cultivars. A delight for the eyes as well, most species in this collection are deciduous, with rich orange to scarlet foliage in the fall. Height/spread 5 feet. For maximum freshness, please keep seed refrigerated in its original packaging until it is time to plant. Sow seed in containers in the fall, or in the spring after cold stratification. To stratify seeds for a spring sowing, soak the seeds for 24-48 hours in clean, pure water, then place in damp peat moss or sterile growing medium and refrigerate for 4 weeks. Plant seeds in starter pots filled with good sterile growing medium, preferably enhanced with extra peat moss, and place in a cold frame, or similar sheltered but cool location. Grow on in moisture-retentive soil, rich in organic matter and a little on the acidic side.